Android smartphone and tablet users can now donate their unused computing power for scientific research. When you're not using your smartphone, scientists can now use it to fight AIDS. A new app for Android lets you donate your smartphone and tablet's unused computing power for scientific research, all while you sleep. It only works when your device is connected to Wi-Fi, is near full-charge and plugged in, so it won't eat up your data plan or drain the battery. When combined with the surplus power of thousands of other "donated" phones, the network of devices make up a quasi-supercomputer available for use by scientists. 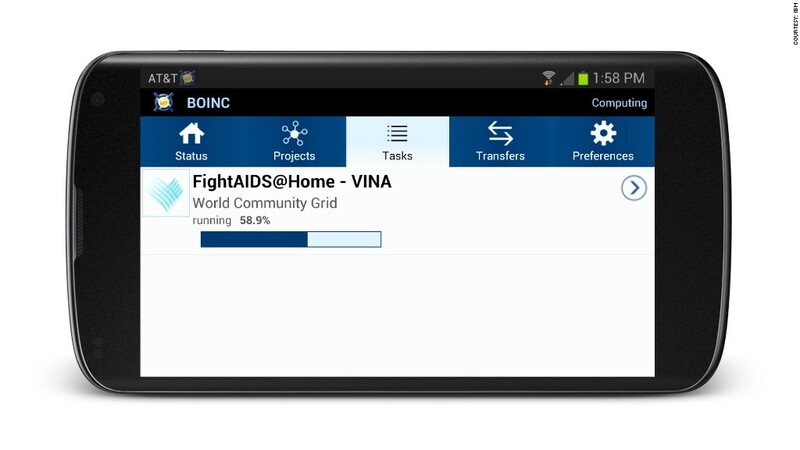 One of the projects that makes use of the smartphone network is called FightAIDS@Home. Scientists working on FightAids@Home are searching for new drugs to treat the HIV virus. It is run by the Olson Laboratory and The Scripps Research Institute and is powered by IBM's (IBM) World Community Grid. The World Community Grid has sponsored more than a dozen scientific research projects over the past decade. But until now, it could only take advantage of idle desktop computers and laptops. Since the Android app, known as the Berkeley Open Infrastructure for Network Computing or BOINC, went live on July 22, its has been downloaded 30,000 times from the Google (GOOG) Play app store. For scientists, the crowd-sourced supercomputer cuts down the cost of doing research and the time it takes to get results. Renting time on a supercomputer can be expensive for nonprofit research institutes, running upwards of $1,000 per hour -- and that does not typically give the scientist access to the entire system. "When we first sat down with researchers, they proposed projects that were far too modest because that's what has been available to them," said Ari Fishkind, an IBM spokesman. "Now they can access a great deal more power." One project working to identify drugs to treat a tropical disease called schistosomiasis is expected to cut down its research time from about 30 years to one year or less by taking advantage of the smartphone network, in addition to the donated PCs on the World Community Grid. Fishkind expects more projects to be make use of the Android app down the road.